Lighting is a great place to start redesigning your house as great lighting enhances the aesthetics and charm of a house. Changing a light fixture completely changes how a space looks. The lighting you choose should reflect the functions and feel of the space. Farmhouse style chandeliers and pendants in muted tones were a craze and a trend in 2018. Let’s look at the lighting ideas and trends for 2019. The reason why eco friendly design tops the list is because it is cost saving for owners. As climate change is an increasing concern everywhere, an eco- friendly approach to lighting needs to be the focus this year. Recycled materials are transformed into new pieces of furniture, home decor and lighting. In case DIY is your thing, then go to the second hand store and see what older fixtures are available to add to the decor. Make sure that older fixtures are in great condition when you use them. Lighting made of natural materials is also topping the list of lighting trends in 2019. This trend focuses on the use of sea grass, cork, wood, bamboo, and rattan. This trend helps keep in touch with our basic need of connecting to nature. This has become a cool trend because in other lighting options, we rely heavily on digital representations which can be detrimental to our health and well being. Lighting made from natural materials help in creating a relaxing and warm environment that improves our well being. Using natural materials ensures more sustainability and does less harm to the environment. Vintage lights are back in style and these are old fashioned and interesting bulbs that give a dramatic look to the room. They may not be the best option for bright lights but is liked by people who love orange and yellow lighting. Vintage lighting gives great warmth to a space. If you are not a fan of the boho style, you may want to do your lighting in industrial style. Industrial style is the common look in cafes, hotels, and restaurants. Rough and rustic metals soothe our stress by reconnecting us to our past. Industrial styles are simple and un-intimidating designs and a style that is chic and is rooted in our nostalgia. Shop around and what you will find are retro fixtures with great finish and details that look like art. Industrial is not a new trend but it continues to be a strong theme for lighting in 2019. A touch of metallic lighting can add glamour to your home. The cool metallic look gives scope to both the silver and gold look and gives you the best of both the worlds. The materials that are commonly used are silver, nickel and steel, and you can mix and match these colour palettes for a sophisticated look for your house. 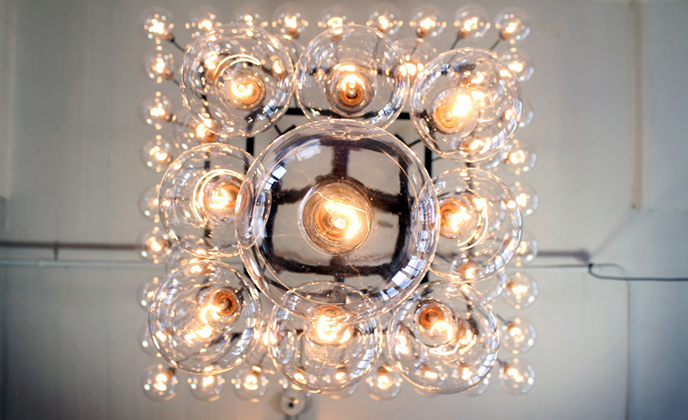 Chandeliers are the perfect way to use metals. Many chandeliers are available in gold and silver finish and give an ageless look to your rooms. The metal chrome also gives a fresh look to the house and brass is great for the kitchen, living room, and bathroom. Accent lighting helps in adding drama and coziness to a room. This trend has never gone out because it focuses light on a particular area. This light is directed right at the things you want illuminated: gardens, artwork, and wardrobe. This kind of lighting helps in shadowing dull areas. Outdoor accent lighting is also very popular as it highlights part of architecture of your home or yard. It is during Halloween and Christmas that outdoor accent lighting gets more popular. Accent lighting gives meaning and importance to the images it shows and this lighting is used a lot in museums and art shows. If you have a great entrance to your house filled with plants and art, then you can use landscape lighting which is a kind of accent lighting to light up the pathway or the precious part of the house. Since a lot of power is wasted in the form of heat in incandescent lighting, there has been a changeover to environment friendly lights. Homeowners are now shifting to LED lights which are considered far more effective. These lights also last longer than other lights. LED gives a unique feel to the house and is available in different styles, brightness, and shapes. People are on an experimental mode and are going for large lighting fixtures for certain areas of their house. Large light fixtures contribute to the wow factor and attract immediate attention from guests. The highlight of these large fixtures is they have an ornate design and act as centre pieces. These lights require a lot of care. If minimalistic designs are not for you, go for discrete lighting. Sometimes the best lighting comes from lights we cannot immediately spot. Discrete lights give a cleaner and a better feel to the room. To apply this trend, you have to choose fixtures that aren’t over dramatic or shiny. These are down lights that are levelled exactly or near exactly to the ceiling. These are simple lights which will not make your ceiling look very busy. Trends may come and go but always go with your instinct. If you feel a certain kind of lighting suits the aura of your space or home, you should shop for it and install it. The best lighting design is the one you love and the one you can look at throughout the day without being bored and tired of it. Geometric shapes have taken over the market and there are many choices available. We have hexagon, triangular, pentagonal shapes available. They usually have eye catching designs with bold lines and repeated patterns. These lights are ideal for adding a modern twist and fit into traditional settings also. Angles and shapes are the inspiration behind this trend. Go ahead and shape up your home with this trend.